Arsene Wenger has faced a barrage of criticism for Arsenal’s poorperformances in 2012 from fans and journalists alike, but now people in high places want him out. Paul Kagame, president of Rwanda, has called on the long-time Arsenal manager to give up the job he’s held for 15 years. Kagame, a noted Arsenal fan, did so on Twitter in an exchange with with Kenyan journalist Philip Etale. He thinks Arsenal’s trophy drought, which is nearing seven years, has allowed mediocrity to set in at the club. Arsenal has lost all three of its Premier League games this year. 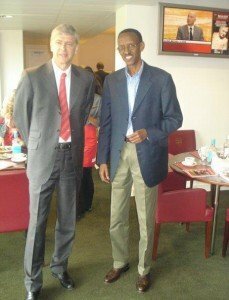 Mr Wenger does not use have a public twitter account but he told a friend « That Kagame should go. Under his presidency poverty is still widespread, the country still depend heavily on aid and his country is the laughing stock of the modern world with his one cow per household deal. Perhaps he should concentrate on running the country, not the premier league ». Mr Kagame’s office refused to reply when contacted by the spoof today. As church leaders with a long tradition of advocacy for refugee rights, we recognise that Zambia has had more than 50 years of refugee protection in this country. Since Independence, Zambia has always been ‘an oasis of peace’ in the midst of a region of conflict. This has consequently made Zambia a haven for refugees. We are inclined to agree with the United States Human Rights Watch and Amnesty International that this is not the time to facilitate the removal of the refugee status. Moreover, the refugee population in Zambia has greatly declined with the voluntary repatriation of thousands of refugees. If anything, we would thus request the Zambian Government to regularise the status of some refugees in this country and facilitate that they be accorded local integration, including freedom of movement and of employment. This will enable them to live normal lives.